In 1978 a Shire Horse enthusiast, an Englishman by the name of Grahame West, started “The Shire Horse Society of Australia.” (SHSA) Grahame designed our beautiful logo and did a tremendous amount of research in England on Shires. He was a friend of the famous Keith Chivers, who wrote the incredible history book, “The Shire Horse.” Grahame searched Australia for Shire types as there were no registered Shires here at that time. Tim Peel helped Grahame with this search and was a fellow founding member of the Society. When Helene and Gregory Scarf became interested in Shires, they also joined the Society and the initial newsletters were produced. 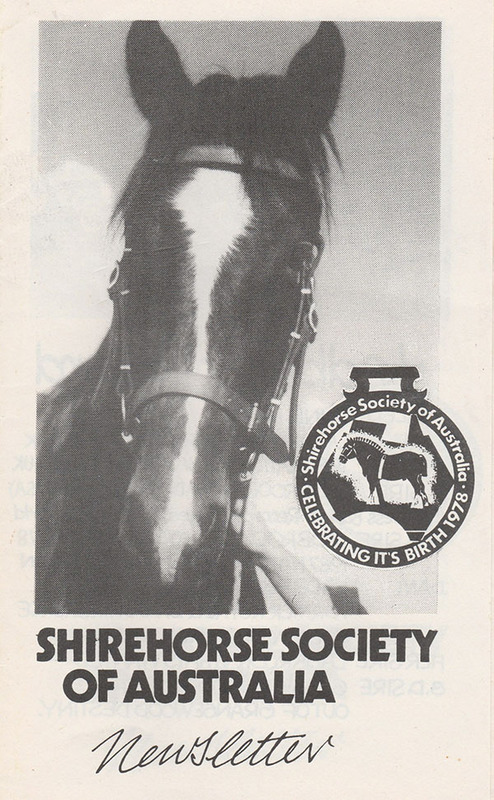 The first Shire Horse Society Australia newsletter, 1981. Helene Scarf imported the first registered Shire into Australia after about a 60 year break, in 1981. That was the then colt, Ladbrook Edward. Helene soon imported more mares and fillies. Shire numbers slowly increased over the next two decades. By 2004, there were enough registered Shires in Australia that Helene Scarf recommended registering the original Shire Horse Society Australia as a constituted group, with the NSW Department of Fair Trading. This would mean proper members and committee, and accountability. The work on the original Constitution of the Shire Horse Society Australia was done by Helene and Greg Scarf, Greg Hosa and Kathryn McKay, Helen and Korrie Kuiper, Sue Bailey and Ineke Kuiper. While being proud of the English heritage of the Shire Horse, the Shire Horse Society Australia exists for the benefit of the breed in Australia. However we do enjoy close connections with both the Shire Horse Society UK, the American Shire Horse Association, and the Canadian Shire Horse Association, which are the only other three groups in the world which run a Shire Stud Book. In 2007, we commenced The Australian Shire Horse Stud Book which is recognised all over Australia and which has been extremely successful. Liz Williams kindly ran a big fund raiser at her Wollongong restaurant to raise the funds to buy the stud book program. We also appreciate the support and help given to us by the American Shire Horse Association, especially Sharon McLin. The Australian Rules of Registration are exactly the same as the UK Stud Book, and the requirements for DNA testing and vet sketching etc are all the same as is required for UK registrations. Our Stud Book Registration Certificate. Grahame West was very pleased to be invited to use his designer skills once again to design a beautiful registration certificate for the Stud Book. The certificate combines Australian themes together with the heritage of the Shire Horse, which originated as the Great English War Horses who carried knights to battle. 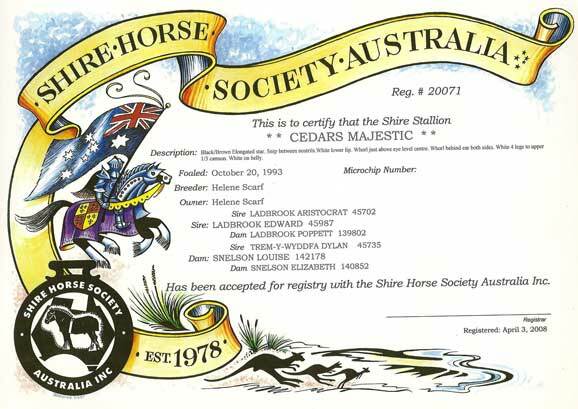 When the Society commenced a Shire Sporthorse Registry, Grahame designed another lovely certificate for those registrations. Our Society has made registering their horses, easier and cheaper for breeders in Australia and New Zealand. On top of that, all funds raised through the Stud Book, are channelled straight back into promoting the breed in Australia, rather than going to a group in a foreign country. Our stud book is online for our members to access, and it traces the lineage of Shires back to the first UK Shire Stud Book from 1880. In this way we are far in advance of the UK Stud Book which is not available to access online. Our Society has also produced a hard copy of The Australian Shire Horse Stud Book and our Registrar, Deb Buckland prepared the publication for us. From left Mark and Tim Peel demonstrating shoeing at a Society seminar. The Society has produced numerous newsletters and run many seminars, clinics, training days, fund raisers, social events and shows. The Society made videos of many of the sessions held at our clinics, which are available for purchase. Our Society has represented Australian Shire owners to show societies and field days, sponsored classes, trained judges and set up an Official Panel of Judges to help maintain the Shire breed characteristics in Australia. The Society has donated two perpetual trophies to Sydney Royal Easter Show, one in memory of Kathyryn McKay and Greg Hosa, and one heritage artefact, which was donated to us, for the Best Shire Gelding award. It is the hoof of a famous Shire Gelding called Comrade, from the 1920’s in England, which was mounted into an solid silver inkwell. Each perpetual trophy must be assessed as being to the value of $3500 and the Society also had to donate $3000 for each one’s long term upkeep by the RAS NSW.. The Society’s Perpetual Trophy at Sydney Royal Easter Show for Best Gelding being awarded to Sarah Dooley with Ingleside Lucky Chance by Judge Ms Louise Beer. The Society has donated engraved pavers and a rose, for the War Animal Memorial in Pozieres France and we are honoured to be associated with the remembrance of all the horses who struggled, suffered, and died in the World Wars. In World War 1 many of them were Shire Horses.